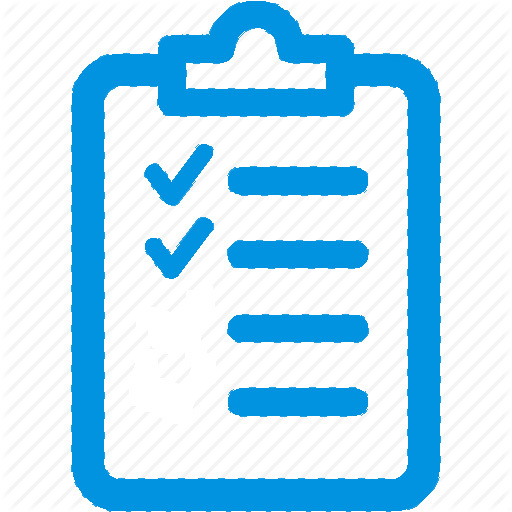 Please Note: Jordan and Israel gratuities will be paid in advance ($120 per person will be added to your final invoice for gratuities to be paid to drivers, guides and hotel staff). 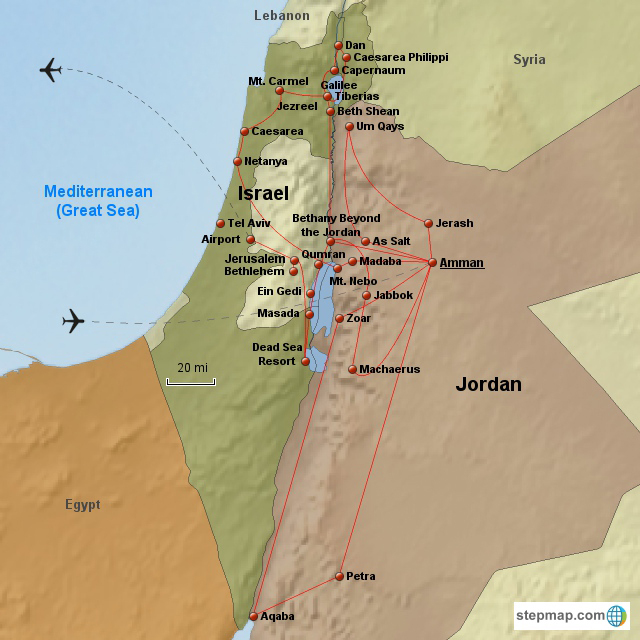 We arrive in the Hashemite Kingdom of Jordan and transfer to our lodging for the next two evenings in Amman. Our first stop today is Um Qays, the old Decapolis city of Gadara, with its spectacular panoramic views overlooking the Sea of Galilee, is the proposed site of Jesus’ miracle of the Gadarene swine. A rare five-aisled basilica from the 4th century was recently discovered and excavated at Umm Qays. Everything about this distinctive arrangement of a church above a tomb at this particular place, strongly indicates that it was designed and built to commemorate the very spot where the early church believed that Jesus performed his miracle. 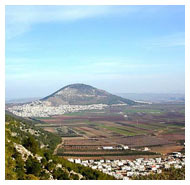 Nearby we find Jabbok, the place that is said to be where Jacob wrestled with God who was in the form of an angel (Genesis 32:24-30). We pass through As Salt, the city that houses the tomb & shrine of Job and tomb of Jethro before returning to Amman. Free time will be allowed for shopping and an optional visit to the Archeological Museum. Traveling southward we stop at a Dead Sea resort for a relaxing float or optional spa treatment. The infamous Sodom and Gomorrah are believed, although not confirmed to be the burned remains of two cities in the nearby southeastern Dead Sea plain. We will view from a distance a hillside cave near to the small town of Zoar (modern-day Safi). The Bible says Lot’s daughters gave birth to sons whose descendants would become the Ammonite and Moabite people, whose kingdoms were in what is now central Jordan. It is here that Byzantine Christians built a church and monastery dedicated to Lot. 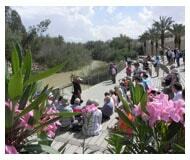 Our next stop today will be at the hilltop palace/fortress of Machaerus, where John the Baptist was beheaded. Next we visit the fascinating site of Bethany on the Jordan, the place where Jesus was baptized by John the Baptist, where Elijah and Elisha crossed the Jordan as well as the area where the children of Israel led by Joshua entered the Promised Land. This morning we visit the amazing mountain fortress of Petra, known to be inhabited by the Edomites - the descendants of Esau. 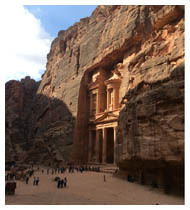 Begin the tour with a walk through the "Siq," an immense crack in the Nabatean sandstone, to the city of Petra carved out of the rose red rock. The Treasury, El Khazneh, is one of the most elegant remains of antiquity. Beyond El Khazneh we are surrounded on both sides by hundreds of Petra's carved and built structures. Departing Petra, we travel northward on the King's Highway where to the west we view the hills bordering the Dead Sea. 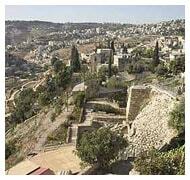 This is the area of the hilltop palace/fortress of Machaerus, where John the Baptist was beheaded. We overnight in Amman for this evening. Our morning tour begins in the town of Madaba, the biblical Medeba, 30 kilometers south of Amman. Madaba is best known for its Byzantine and Umayyad mosaics and at the Greek Orthodox Church of St. George we view the earliest surviving mosaic map of the Holy land. Mt. Nebo, believed to be the site of the tomb of Moses, commands a spectacular view across the Jordan Valley and the Dead Sea. Study the panorama as we read the scripture of God showing Moses the "Promised Land" before He brought him home to heaven. As we travel west toward the Allenby Bridge, we view to the north the Plains of Moab, the area where the tribes of Israel camped before crossing the Jordan and picture the place where Jesus was baptized. Crossing into Israel, we drive to Jerusalem with the remainder of the afternoon free.